Why do unemployment, high deficits and a lagging sense of confidence plague the nation once regarded as a "solution looking for a problem"? WHAT IS happening in the country once prized as a beckoning treasure trove of almost limitless opportunity, especially for youth? Why is Canada still experiencing the effects of the Great Recession of 1982? How will the United States be affected by the economic conditions of its neighbor to the north? Canada's new Conservative government has made the economy its number one priority. And as Prime Minister Brian Mulroney picked up the reins of power, he received some good news. Ontario — the province that is Canada's economic engine — is showing renewed signs of vigor and confidence. The provincial growth rate could hit 5 percent this year. Moreover, the spillover effects of the booming U.S. economy are finally being felt. Many segments of the private sector are still concerned about how solid the recovery will be. For instance, the construction, engineering and finance industries are not yet, at least, sharing in the boom. And it could be quite a while before a serious dent is made in Canada's high — more than 11 percent — rate of unemployment. But why the lingering doubts about Canada's future? Finance Minister Michael Wilson recently observed: "One hundred years Canada lived on its resources. For the past 10 years it has lived on credit. Now it must live on its wits and its intelligence." Let's see how it all happened. At the end of World War II Canada found herself temporarily the world's third most important country! With European and Japanese industry devastated, Canada's ample reserves of wheat and minerals — especially the strategic reserves of oil, iron ore, uranium, aluminum and hydro electricity — not to mention her booming population, propelled Minister Canada — to a peak of world influence exceeded only by the United States and Soviet Russia. Those were heady days. Population soared from 11,500,000 in 1941 to 17,000,000 by 1958. The value of Canadian wheat exports more than doubled. Mineral production jumped nearly ' fourfold. Manufacturing output tripled! Imperial Oil's "blow in" of a new well at Leduc, Alberta, in 1947 kept pace with one of the world's largest iron-ore finds near the Quebec-Labrador border In 1948. Ontario hummed with news of rich uranium strikes in her ancient treasure chest, the Canadian Shield, while Kitimat, British Columbia, was host to one of the world's largest hydroelectric plants for the aluminum industry. Even the mild post — Korean War recession of 1953-54 couldn't halt the seeming headlong rush of the Canadian economy. Yet, by 1958, a full-scale recession raged. Part of the problem, of course, was the familiar boom-bust cycle of the free-enterprise system. Canada's remarkable growth in the 1950s concealed basic structural flaws. Her resource boom pushed men and equipment north. Canada's harsh winters are proverbial. This makes resource extraction and processing, not to mention transportation, an expensive venture. Then too, was the matter of dependency on foreign capital. "Canada has always been heavily dependent upon foreign capital to finance her economic expansion. In 1900 Britain supplied 85 percent of the foreign capital invested... by 1926, 54 percent of imported capital came from the United States.... In 1959 investment from the United States was 76 percent of the total" (Ricker, Saywell, Rose, The Modern Era. pages 307-308). The truth is, a nation like Canada, with a small domestic market, is vitally dependent upon foreign trade and especially trade with her best customer, the United States. Economic nationalists led by Finance Minister Walter Gordon (1963-65) pointed out legitimate concerns about the scope of American industrial projects in Canada, but the bottom line was painfully clear: The Canadian economy is at the mercy of American policy to an uneasy extent. And by the early 1960s the United States itself was encountering economic head winds. "Trade or fade," U.S. President John F. Kennedy warned his fellow — countrymen in 1962. In June 1957 six of the war-ravaged nations of Western Europe, rebuilt in part with the help of Marshall Plan dollars, formed the European Economic Community. It worked. Volkswagen sales in North America signaled a new economic era — a shrinking global market for Canada as aggressive multinational corporations vied frenetically for a larger slice of a world economy where demand seemed to outstrip production. Yet Canada enjoyed a mild boom from 1964 to 1966. U.S. President Lyndon Johnson's step — up of the Vietnam War was a stimulus. Asia's industrial spurt in the 1960s boosted Canadian trade just as Japanese investment in Canada began its steady climb. Cold War pressures also rebounded to Canada's advantage — Cuba and the People's Republic of China "bought Canadian" during the decade. Unemployment averaged only 4 percent. Inflation was held to 3 percent. Near stability. But the Canadian economy was living on borrowed time. The inflationary impact of the Vietnam War grew. An industrial slowdown in 1967 pointed to troubled times ahead. Twenty years of general prosperity, the "bigger and better" mentality, had set the stage for the harrowing inflation battles of the 1970s. Everyone expected more, not less, from the marketplace. Global trends deeply affected Canada, with her comparatively small domestic market. By 1970, the very pillars of the postwar monetary and trading system were shaking. West Germany revalued the mark in October 1969. This helped intensify the American slump as the leveling-out effects of the Vietnamese war boom took hold. America's nose dive played havoc with Prime Minister Pierre Trudeau's "War on Inflation" of 1969. Canada cut back as America declined. The money supply was reined in sharply, but the inflation psychology was not broken. Prices continued to rise. Worse still, continued inflation kept interest rates in Canada high, as lenders hoped to ensure themselves against the declining value of money. Speculators and foreign capital invaded Canada to reap the higher rates. Worried about the confusing situation, the federal government took the fateful step to float the Canadian dollar on the currency markets in May 1970. Over a year later, in August 1971, U.S. President Richard Nixon closed the gold window. He devalued the U.S. dollar twice in 1973. The day of reckoning was here at last. In neither country could government fine tune or bailout economies exposed to the crosswinds raging in the interconnected world economy. The OPEC oil embargo of 1973-74 from the short Arab-Israeli war exposed Canada's hidden economic weaknesses to the full gales. These weaknesses were rooted in geography and culture, politics and resources, all intertwined within the very structure of the Canadian nation — state. Canada was still, by the 1970s, too much a branch — plant economy, based on the United States. The nation was content to live off high foreign investment and resource sales. The motivation to capitalize on scientific research and development was lacking. "To get it marketed I've got to go south of the border!" many Canadian entrepreneurs declared in frustration. There have been notable exceptions, but Canadian talent has tended to move to the United States with its vast market and investment potential. Also, in spite of federal grants for technical education, there was still a chronic shortage of skilled workers. Another problem: The provinces are supreme in educational policy, a reflection of the multiculturalism and diversity Canadians prize. Regionalism, the vast geographic divisions of Canada, has played its part. The spectacular opening of the St. Lawrence Seaway system in 1959, for example, permitted foreign vessels to carry goods up and down through the heartland of North America. Yet it helped decimate once — thriving Atlantic ports and terminals like Halifax, Nova Scotia, and Saint John, New Brunswick. Federal-provincial bickering, spurred by regionalism, also helped sap the vitality of Canadian business. Resource wars broke out in the 1970s between Ottawa and the energy-producing provinces out West. To protect manufacturing plants in Ontario and Quebec, traditional locomotives of the Canadian economy, the Westerners were forced to sell oil at federally controlled domestic prices. "Sell us your gold at $35 an ounce," snapped irate Western Canadians, "and we'll hold down the price of oil!" The federal government retaliated with the National Energy Program of 1980, a revenue-sharing pressure move sweetened by a belated attempt to "Canadianize" the oil industry. The Westerners' resource boom — after ducking high interest rates, the world oil glut and the recession — finally ground to a halt. A chronic farm crisis accounts for a little — publicized part of Canada's economic disorders. In a truly balanced economy, industry and agriculture are compatible. The Canadian climate, however, often militates against the continued success of small farmers. The U.S. — inspired world wheat glut of the 1960s didn't help. Wheat prices were actually lower in 1970 than they had been in 1949! Worse, tariffs to protect Canadian manufacturing usually mean higher costs for the farmer — tractors, combines, fertilizers and fuel. Attempts to stabilize the price of grain favored the automated, mechanized farm operators. Thus, agribusiness tended to squeeze out the small farmer. The latter incurred costly debts just to stay in operation. Worst of all undoubtedly, the decades of generalized prosperity spawned a "we want more" mentality on the part of the Canadian work force. Wage settlements above production increases helped fuel inflation. And, most critically, during the 1960s and '70s, Canadian federal and provincial governments greatly expanded welfare• programs. To pay for this, there was a massive increase in deficit spending. The defense budget was also slashed. Canada's once proud armed forces now rank on a par with those of Ecuador and the Philippines, according to one Canadian defense expert. Canadian and American businessmen and bankers now peer nervously over their shoulders at huge federal deficits. Shockingly, though the size of the U.S. deficit makes the headlines continually, Canada's budget deficit is twice that of America's, on a per capita basis. As in Washington, heavy government borrowings in Ottawa just to pay the interest on debts lead to continued pressure on interest rates. This chokes out incentives for business to invest. The new government, moreover, has indicated it will not likely make serious cuts in the costly social programs upon which Canadians have come to depend. But what of the new "Information Economy" we hear so much about? Will computer-aided manufacturing and robotics pull Canada and other industrial nations out of economic doldrums? Alert Canadians were among the first pioneers of the technological breakthroughs of the 1970s. DevaIon Electronics of Saskatoon, Saskatchewan, marketed as early as 1974 a device that can make 20,000 connections to a central computer. Toronto's Spar Aerospace gave the Columbia space shuttle the famous Canadarm. Then there is the $3 billion giant Northern Telecom, a world leader in innovative telecommunications. "If new technology is developed outside the borders of the country, and if equipment embodying the new technology (industrial robots say), is imported, the country misses the beneficial effects on the first round. If, however, the technology is embodied in finished, imported consumer goods, the national economy misses out on both the first — and a good part of the second — round benefits" (Saturday Night, July 1984, page 26). "We're heavy net importers," says Ken Jones, President of the Ontario Center for Advanced Manufacturing. "We're using somebody else's equipment. We're behind by three or four years." Canadians, like most people in the Western world, want to save the economic system now unraveling before their eyes. It is reminiscent of those in the prophet Isaiah's day who wanted to ignore the evidence of continued national decline. "The Lord sent a word against Jacob, and it has fallen on Israel... who say in pride and arrogance of heart: 'The bricks have fallen down, but we will rebuild with hewn stones'" (Isa. 9:8-10, Revised Authorized Version throughout). 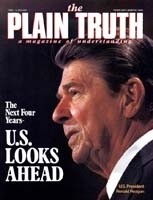 Longtime readers of this magazine know the national identity of Canada, the United States and Britain in Bible prophecy. Our original English-speaking people are lineal descendants of the "lost sheep of the ancient house of Israel," the 10 tribes that disappeared from secular history in the late eighth century B.C., 130 years before the two tribes of the house of Judah went into their national captivity (II Kings 17; Matt. 10:6). An amazing book, The United States And Britain In Prophecy, available to you for free, reveals the difference between the ancient house of Israel, and Jews who form the modern state of Israel; and it makes clear the real causes of our once-soaring standard of living. It also uncovers why things have gone so badly for us in recent years. Anciently, almighty God promised our forefathers: "The Lord your God will set you high above all nations of the earth.... You shall lend to many nations, but you shall not borrow" (Deut. 28:1, 12). Isn't this a perfect description of the United States and Canada in 1945? "A nation whom you have not known shall eat the fruit of your land and the produce of your labor.... He shall be the head, and you shall be the tail" (Deut. 28:33, 44). "Trade or fade" we were warned in the 1960s. Strikes, blame-placing, voting in new leaders, hoping to go back to business as usual — none of this will work. We must recognize the real enemy — "Your ways and your doings have procured these things for you. This is your wickedness... because it reaches to your heart" (Jer. 4:18). Robert Blair of the Calgary-based Nova Corporation put it well: "We demanded and our institutions encouraged us to become a high-borrowing society." The enemy is all of us! Canadians are paying the price of more than two generations of materialism, comfort-seeking and self-indulgence! Other nations taking that course throughout history have either perished or had to make radical course changes to avoid the loss of national vigor such a lifestyle engenders. God is pleading with all Canadians — and all North America — through the pages of this article. He has a message to deliver before further distresses overtake the breathtakingly beautiful land of Canada. It is this: "Change the way you are going! Think about where these trends are leading!" "I call heaven and earth as witnesses today against you, that I have set before you life and death, blessing and cursing; therefore choose life, that both you and your descendants may live" (Deut. 30:19).